The mastermind behind the organized effort to shoot drones out of the sky is a man named Phil Steel. 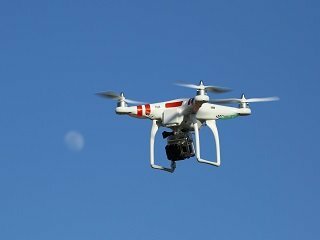 Steel, a U.S. Army veteran with a wry sense of humor, proposed the idea for a city ordinance to allow $25.00 drone hunting licenses to Deer Trail residents which would allow permit holders to down any drone within city limits. But if that idea doesn’t seem bold enough, Steel also suggested that the city pay a bounty for each drone shot down. The infamous city meeting where Steel’s idea was hatched occurred in August of 2013 where Steel not only surprised the attendees with a 2800 word ordinance, which he wrote himself in four hours, but he also entered the room to the dubious music of “The Good, the Bad and the Ugly.” The trustees of the town split their votes 3 to 3 on the ordinance, which automatically kicked the proposal to the residents for a vote. Although Mr. Steel obviously presented a light-hearted and humorous case against government spy drones violating the 4th Amendment of the Constitution, many understand the underlying potential problem with drones over their town, whether they like Steel or not. One unnamed resident declared, “I agree with the 4th Amendment rights [argument], but I don't like him." The mayor of Deer Trail, Frank Fields, is seeing dollar signs at the possibility of more revenue coming into the small, sleepy town. Fields decided to get in on the hype by placing a large, “No Drone Zone” banner on back of his barn after the proposal attracted outside media attention. Regardless of your opinion on shooting drones out of the sky, this issue will be coming up a lot in the near future and it might lead to others like Steel to speak out about legitimate privacy and liberty rights.